Lady Caught Between Two Fishes and the Tiger Looking In (1990), oil on canvas. Collection of Virginia Union University. RICHMOND, VA.- Virginia Union University announces Thornton Dial, a landmark exhibition of works by acclaimed contemporary American artist Thornton Dial (b. 1928, Alabama). The exhibit opened April 26, 2012, at the VUU Museum Galleries located in the universitys Wilder Library. A companion exhibit of Dials work will also open June 1, 2012, at Art6 Gallery in Richmond. 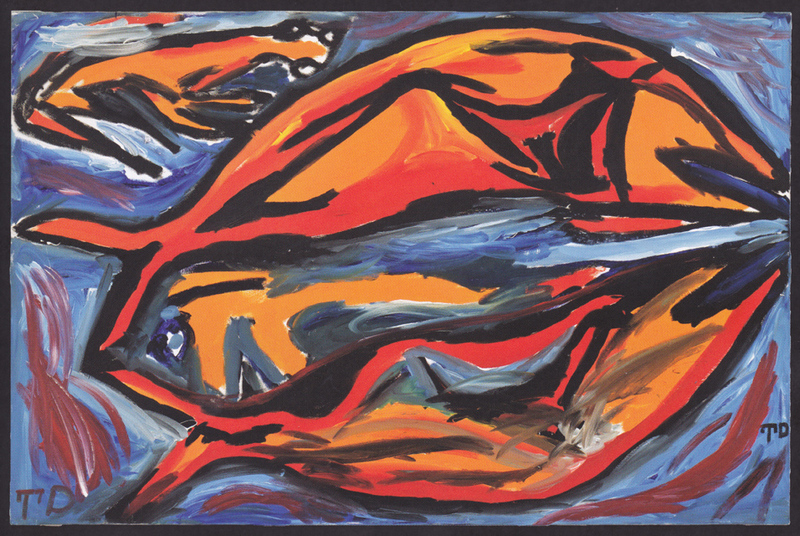 Thanks to the generosity of life-long Thornton Dial collectors Barbara and James Sellman, Virginia Union Universitys permanent collection of paintings, drawings and sculpture by Dial has now become one of the most important repositories of his work in America. The exhibition also includes significant loans from the Sellman familys LLC Collection. Visitors are able to see highlights from Dials remarkable artistic evolution as his art progressed from an intensely colored abstract style to a simpler, but equally vigorous expressionistic late style. Dial, whom New York Times critic Michael Kimmelman once called preternaturally gifted, is self-taught. He married in 1951, fathered five children and worked in the Bessemer Pullman factory for thirty years. By the late 1980s Dials art began to be noticed by important collectors. Today his work is in numerous private and public collections, including the permanent collections of the Whitney Museum of Art, New York, N.Y.; the Museum of Fine Arts, Houston; the High Museum of Art, Atlanta; the Philadelphia Museum of Art; the Hirshhorn Museum and Sculpture Garden, Washington, D.C.; the Smithsonian American Art Museum, Washington, D.C.; the Indianapolis Museum of Art; the Birmingham Museum of Art; the Milwaukee Art Museum, etc. Dials work was also included in the 2000 Whitney Biennial. Survey and retrospective exhibitions include Thornton Dial in the 21st Century which was mounted by the Museum of Fine Arts, Houston, in 2005; and most recently, Hard Truths: The Art of Thornton Dial, a two-year traveling exhibition (2011--2013) which originated at the Indianapolis Museum of Art and will also go to the New Orleans Museum of Art, the Mint Museum, and the High Museum of Art. Thornton Dial runs through October 31, 2012.